The rise of intolerance seems to be alarming at present. The peculiar feature of it is that all voices of intolerance are not one and the same. Tolerance to inhuman practices is a age old phenomenon in this society. Human beings who have to be rational must be intolerant to irrational practices and events. They should be intolerant against inequities and injustice meted out to them. When the history of 20 centuries and even earlier is scanned, it would be vividly evident that the major section of the mankind of this land were made subservient to dogmas and doctrines in the name of god and religion, thereby they were tempered over a period of time to be tolerant of slavery. It is not mere the existence of social slavery, the slaves were made to enjoy their slavery. The social slavery was glorified as divine and as a design, created by god. Their life style was tuned as such and any violation of it was considered as crime and deserved punishment till such so called deviants are alive and even after their death. This sort of centuries old inequitable tolerance was sanctified by the people who raise voice of intolerance at present, alarmingly. It is not the same people who designed the inequitable tolerance but they are the people who stake claim for the heritage of sustaining such an evil design in the society. Presently, the intolerance exists in the society and its rise is not right in a collective sense. The nature of intolerance is not in totality; it is choosy; it is self-oriented. The relativity is lacking. Whenever it is convenient, the fundamentalists of the dominant section of the masses support or oppose on the right to freedom of speech and expression. When religious dogmas of other sects are exposed, the claim for the right to freedom of speech and expression rose to the sky, under the guise of intolerance. When such rights are exercised against their own religious dogmas, then their support for the right to freedom of speech and expression becomes dismal. This is the dilapidated tactics of the culturally dominant, oppressive section of the society. When ‘fatwa’ was issued by the then political head of foreign state against Salman Rushdie for his Satanic Verses, the other religious countries provided asylum for him. The fatwa issued against him has transnational impact. India need not have any reservation on the version of the Satanic Verses since it is a Secular State. 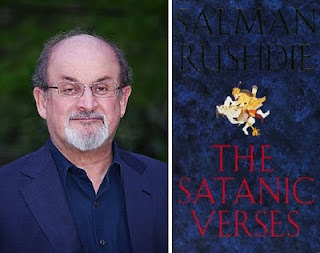 In order to appease the section of the people in India who follow the dogmas of religion against which Satanic Verses speak; it develops an illusion as if there would arise some security threat had the Britain dwelling Salman Rushdie attended the recently held Literary Festival in Jaipur, Rajasthan. When the security threat was discussed widely, no state machinery either in Maharashtra or Rajasthan was bold enough to share the perceived probable security threat. Even foreign litterateurs who read certain quotes from Satanic Verses at the Festival were pressurized to leave the venue and the country immediately. But the entire blame of probable security threat was shifted, to the premises owner where the Festival was held, under the guise of the apprehension of an individual. In that case what for the State exists, which is expected to maintain law and order. But the strange affair is criticism about such unsecured condition in a Secular State by the other sect of fundamentalists. They raise their voices in support of freedom of speech and expression. What were their views few decades back when Dr. Ambedkar’s book ‘Riddles of Rama and Krishna’ was published in Maharashtra. The same sect which advocates for freedom of speech and expression today was against the publication of Ambedkar’s book. The fundamentalist forces were diplomatic enough to celebrate the Birth Centenary Dr. B.R.Ambedkar, but opposed the publications of his writings. Same is the case when the foreign movie ‘The Da Vinci Code’ was released in India. It was banned for the reason that it hurts the sentiments of the particular religious sect. Latest episode is the release of biography of Taslima Nasrin, its seventh volume, Nirbasan at Kolkata Book Fair. It is just the release of biography of an atheist writer and not even a seminar, workshop or public meeting to deliberate on the contents on the book. The release of the book itself was not allowed at Kolkata, an important city in Secular India. But the adjoining State, Bangladesh, despite its deep faith in the religion against which Taslima Nasrin remains as a prolific writer, has provided a climate for the release of the book. In all these episodes, the tendencies of intolerance have been exhibited. But such tendencies are mutually conflicting. They cannot discharge their protest and opposition under one banner. The reason being, the opposing forces hail from different religious sects. Shadowing up their inherent conflicts, they project themselves as a force fighting for the fundamental right to freedom of speech and expression, whenever the dispute is raised about the religious dogmas other than their own. The forces behind the rise of intolerance in the name of fighting for the right to freedom of speech and expression are different with strong conflicting fundamentals ideologically as well as organizationally. Under such circumstances, the State which is expressive ‘secular’ constitutionally has to remain neutral, non-aligned and naturally with the support of atheists, rationalists and humanists. But the prevailing position is not like that. The State suffocates and suffers due to these fissiparous tendencies and rise of intolerance. All these inadequacies may be attributed to the secular approach adapted by the State which is indifferent. In letter it is right. The spirit behind it is different. The word ‘Secular’ means non-religious. The State should distance itself from the religious affairs. If one religious practice creates disharmony, the State should approach the issue in a humanistic way. Such approach has to be adopted whatever be the religion that creates nuisance to the society and its harmony. Instead of that, at present, State encourages every religion, of course not equally, provide patronage which cannot be the duty of a Secular State. What role we rationalists need to perform at this juncture? As rationalists, we have to expose the real face of the fundamentalists who speak for the right to freedom of speech and expression for their convenience then and there. The contradiction between such forces should be sharpened and exposed at the times when rise of intolerance is projected as collective efforts with alleged coherences among them. Certain provisions of constitutional law of India have to be amended. Article 19(i) (a) speaks about the fundamental right to freedom of speech and expression. Article 25 speaks about the right to freedom of practice and propagation of religion. It protects the freedom to practise rituals and ceremonies which are the integral part of the religion. In exercising these fundamental rights, in the name of ‘reasonable restriction’, freedom of speech and expression is curtailed to protect the sentiments as freedom of practice and propagation of religion. Freedom of religion could be possible only in an island where there exists no other religion. Many rituals and ceremonies are contradicting mutually among the prevailing religions. When the religious sentiments encourages inhuman practices, then the reasonable restriction need not be applied and should not be applied on the right to freedom of speech and expression. Suitable amendments must be brought to provide exception clause on reasonable restriction for freedom of speech and expression providing immunity to the opposition made by fundamentalist. Amending the constitutional provisions is not a simple task. Lot of debates and discussions, involving the real secular political forces and various humanist movements are required. Let the initiatives be done by the rationalists under the banner of FIRA (Federation of Indian Rationalist Associations). We may be miniscule comparing to the vast population who adheres religion, either consciously or as convention without application of mind. The task is challenging. We should remind ourselves, that in the history, many revolutionary happenings had been initiated only by few individuals. One footstep may look insignificant but necessarily it is the first step for the long march. The droplet may be tiny. It is the basic structure which devolves as the big flow stream. Let us resolve ourselves! Let us start today!